�Gathering together three great assumptions of the role of Santuzza from the 1930s, this set has huge documentary value. Collectors will surely be familiar with Richard Caniell�s previous work on the composer-directed Holland performance (Guild 2241), but even if that were the single CAVALLERIA here, [this] new release would be worth purchase. The sound is clearer, more vivid; and Lina Bruna Rasa was the composer�s favorite Santuzza, to boot. But there are two other reasons to obtain this set: Dusolina Giannini in one of Caniell�s famous composite performances (and with a few bonus tracks with Giannini thrown in for good measure), plus Giannina Arangi-Lombardi in Molajoli�s Columbia set, recorded in 1930. Thus it is that Immortal Performances�s set contains the three major types of reissue it excels at: composite (akin to the �dream casts�), live, and transfer. The first CAVALLERIA is the composite performance. The Prelude (Met, Papi, c.1926 from a Brunswick) is given with a real sense of tendresse at its opening, with Gigli�s Serenade from an April 1940 recording as an insert. There is remarkable detail to the Prelude [and] Gigli�s contributions to this particular CAVALLERIA are always strong and focused, yet as his �Intanto, amici, qua!� shows, he can be incredibly sweet-toned. The strong Met Chorus is a real boon to Setti�s nice, flowing tempo for the opening chorus (from a Victor original); it returns under Setti for the Easter Chorus, here a masterpiece of devotion, the journey to its overwhelming climax a masterpiece of timing from the conductor. The interactions between Giannini and Claramae Turner after Santuzza�s entry (Standard Hour, 1943) carry all the power of a performance live in an opera house. Carlo Tagliabue�s �Il cavale scalpita�, from a Cetra original, is full of life. Tagliabue�s high register is impeccably strong. Giannini�s �Voi lo sapete� returns us to the Standard Hour, a fine performance of great interior emotion that finds Giannini able to shade her voice and phrasing with kaleidoscopic imagination; this of all tracks in this performance rewards repeated listening, while the Giannini/Gigli duet �Tu qui, Santuzza� (Victor, 1932) carries huge power, not least because of Gigli�s pure vocal heft. From Gigli�s wonderful �Intanto, amici, qua!� through to the end is taken from a 1927 Vitagraph original from the Manhattan Opera House; the Met Chorus and Orchestra, listed on the label as the �Vitaphone Symphony��the power of the combined talents of Gigli, Tagliabue, and Turner comes through, with Gigli�s cries of �Mama� being heart-wrenching. Interestingly, this Vitaphone recording was never released on commercial discs. This is a nearly complete performance (only the Santuzza-Alfio duet is absent). That does mean there is space for a Giannini bonus, however: a supplemental �Voi lo sapete� with a rather inferior orchestra, yet imbued with great impetus from the singer; a hugely powerful �Son guinta!� with a searing top and a �Pace, pace� full of grace from Verdi�s FORZA. There follows a Milton Cross-announced New York Philharmonic concert from March 1, 1936 at which Giannini was accompanied by Edwin McArthur on piano. Her performance of Strauss� Zueignung�is glorious. Even the piano is well captured�.the way Giannini caresses the phrases is beautiful, sculpting the performance until the final climactic high note seems inevitable. If the song �Believe me, if all those endearing young charms� is sweet, it is clear Giannini believes in it; finally, and with orchestra, comes the slinky Neapolitan folksong �Manella mia� (it may bring Carmen to mind). The second performance of CAVALLERIA is taken from the Columbia original and was recorded in 1930. Both this and the final offering feature Antonio Melandri as Turiddu. He was active at La Scala from 1926 until 1934; Richard Caniell equates his voice with that of Ramon Vinay, which should give you some sort of reference point. The Columbia is the earlier of the two performances, and Melandri�s voice is in fine fettle. His opening Serenade is strong and virile, as is his Brindisi. Molajoli is a fine steersman through this CAVALLERIA, and he can create the true spirit of the piece as well as accuracy at times (try the strings at �Fior di giaggiolo�); only his Intermezzo veers towards the tepid. A man of the theater through and through, he finds tremendous orchestral detail, often anchoring the orchestral sound from the bass up. The lower orchestral contribution propels the tension in the section from �A voi tutte, saluti�, for example. Giannina Arangi-Lombardi made only four complete operatic recordings (this is one; the others are AIDA, GIOCONDA, and Helen of Troy in MEFISTOFELE). She does seem to have the perfect voice for this repertoire. There is a slight, not unpleasant, edge to her voice which adds significantly to its expressivity. Her �Voi lo sapete� is one of the true highlights of this performance, given over a bed of glowing warmth in the strings. �Like Dusolina Giannini, Giannina Arangi-Lombardi brings impressive vocal and dramatic credentials to the role of Santuzza. The Turiddu, Antonio Melandri, has a rich and vibrant voice that is rather thickly produced. He certainly understands the role and throws himself into it wholeheartedly, but Melandri�s technique does not seem to allow for much dynamic variety or subtlety. That said, he is what we old-timers like to call �the real thing�, a singer who has both the voice and temperament for verismo opera. The remaining singers are fine, and Lorenzo Molajoli, who conducted several La Scala studio recordings, leads a performance of considerable momentum and, where appropriate, beauty and charm (the string portamentos, a souvenir of another era, are quite arresting). 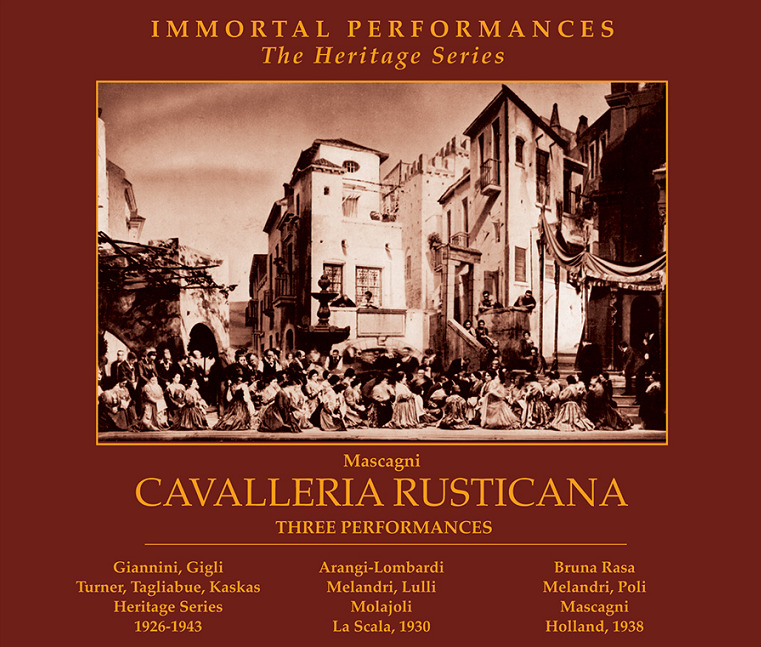 A recording survives from those 1938 performances [at the Dutch Royal Theater in The Hague, in which] Mascagni led a series of CAVALLERIA performances and it makes for an intriguing comparison�.it has far more of a sense of pulse and forward drive, so essential to this verismo melodrama�.I�m not sure I have ever heard another artist who equals Rasa�s genius in creating a believable flesh and blood character of out Santuzza. Rasa throws herself into the drama and music with a frightening intensity. Listen, for example, to the way Rasa cries out �l�amai� (�I loved him!�) in her confession to Mamma Lucia, �Voi lo sapete�. It is the shriek of a wounded creature who has lost all hope. In 1938, Rasa was in more secure voice than for the 1940 EMI studio recording. And the mike placement for the live performance provides Rasa�s voice more space, revealing a far more attractive, equalized, and less tremulous quality. 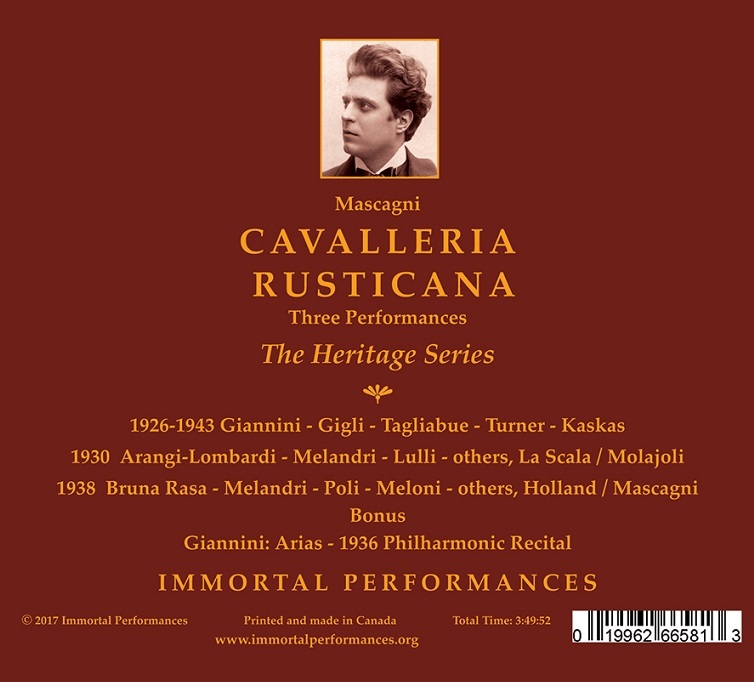 If you love CAVALLERIA, you must hear Lina Bruna Rasa�s Santuzza, and for that the 1938 Dutch performance is the [recording] to have. Antonio Melandri reprises his Turiddu, now darker and thicker of voice, and more stentorian too. Once again, there is not a great deal of subtlety to be found here - that is, until the �Addio alla Madre�, hushed, tender, and carefully sculpted, as Turiddu prepares to meet his death. Afro Poli is a particularly lively and involved Alfio, one given to extra-musical interpolations that may or may not be to your taste. Maria Meloni and Rina Gallo-Toscani are excellent as Lola and Lucia. The prompter is often quite the presence as well; again, you will need to decide whether that is a drawback. But all in all, this is a thrilling and propulsive rendition, starring a unique, once-in-a lifetime Santuzza. It belongs in any representative collection of the work. The sonic restorations by Richard Caniell are all first-rate. 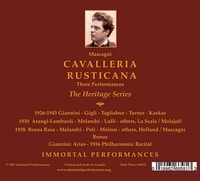 He does a brilliant job of matching the sound worlds of the various sources for this Heritage Series CAVALLERIA (they span the years 1926�43) that occupies disc one. The 1930 Columbia studio recording has impressive definition and presence, allowing one to enjoy both the vocalists and the wonderful La Scala Orchestra musicians. Comparing a previous 2003 issue on the Guild label of the 1938 Dutch performance with this new Immortal Performances set reveals noticeably improved focus and equalization�.